The cuisine of Kentucky mostly resembles that of traditional Southern cuisine. Some common dinner dishes are fried catfish and hushpuppies, fried chicken and country fried steak. These are usually served with vegetables such as green beans, greens, pinto beans (or "soup beans") slow-cooked with pork as seasoning and served with cornbread. Other popular items include fried green tomatoes, cheese grits, corn pudding, fried okra, and chicken and dumplings, which can be found across the commonwealth. In addition to this, Kentucky is known for its own regional style of barbecue. This style of barbecue is unique in itself given that it uses mutton, and is a style of Southern barbecue unique to Kentucky. Although Kentucky's cuisine is generally very similar to that of traditional Southern cuisine, it does differ with some unique dishes, especially in Louisville where the Hot Brown and Derby pie (a variation of pecan pie, common throughout the American South), originated. 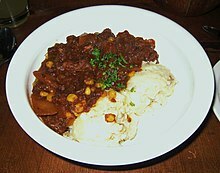 In northwestern parts of Kentucky, burgoo is a favorite, while in southwestern parts of the state, regular chili con carne is a typical staple. In northern Kentucky plus Louisville and Lexington, Cincinnati chili is a popular fast food. Northern Kentucky and the Louisville area are also home to a pronounced German-American population, translating into northern-like preferences for beer and European sausages. However, the remainder of the state's cuisine tends to be thoroughly Southern, preferring breakfast meats like country ham, ground pork sausage and as their beverage of choice, the state's renowned bourbon whiskey. Some common desserts are chess pie, pecan pie, blackberry cobbler and bread pudding. Johnny cake, also known in some regions of the state as spider cornbread, is a flat corn bread cooked by direct heat. Ski , a citrus soda made from orange and lemon juices manufactured by the Double Cola Company prevalent in the Southern part of the state. Blackberries, peaches, apples, watermelon, cantaloupe, pears, plums, grapes, cherries, pawpaws and persimmons. Walnuts, pecans, almonds, peanuts and cashews. The Ohio River region of western Kentucky, namely Daviess, Henderson and Union counties (the area centering on Owensboro and Henderson) has developed a unique style of pit barbecue, featuring a heavy dose of vinegar-based sauces, often served with pickles, onions, potato salad and coleslaw. The three main meats used are chicken, pork and mutton. Burgoo is a specialty. Owensboro is home to the International Bar-B-Q Festival, which is a sanctioned barbecue competition. Farther to the west, in the Purchase area, pit barbecue is primarily pork shoulder, with the unmodified word "barbecue" referring specifically to that meat. The other meats used in the Owensboro–Henderson area are generally available as well. Sauces are essentially identical in the two regions. ^ "Hall's on the River". Hallsontheriver.com. Retrieved 2012-03-07. ^ "Ramseys". Ramseysdiners.com. Retrieved 2012-03-07. ^ "Bluegrass, Blues and Barbecue Region of Western Kentucky: Home". Bbbregion.org. Retrieved 2012-03-07. ^ "Ole Hickory Pit, old Western Kentucky tradition". Louisvillehotbytes.com. 2009-08-20. Retrieved 2012-03-07. 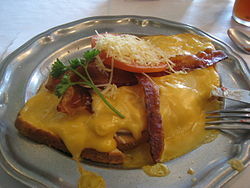 ^ "The History of The Brown Hotel's "Hot Brown"". The Brown Hotel. Archived from the original on 2009-08-22. ^ "Derby-Pie". Kern's Kitchen. Retrieved 2012-03-07. ^ "The Mint Julep". Kentucky Derby. Archived from the original on December 8, 2006. Retrieved 2006-12-03. ^ "Hot Brown Recipe". The Brown Hotel. Archived from the original on August 28, 2006. Retrieved 2006-12-03. ^ Rick Howlett (July 21, 2012). "The Modjeska: A Star On Stage, Sweetly Remembered". Weekend Edition Saturday. NPR. ^ Alvey, R. Gerald. Kentucky Bluegrass Country. University Press of Mississippi, 1992. ^ "A Way with Words | When is a Bell Pepper a Mango? (minicast)". www.waywordradio.org. Retrieved 2019-03-06. ^ "Q&a". The New York Times. 1984-05-09. ISSN 0362-4331. Retrieved 2019-03-06. Domine, David. A Feast for the Eyes. McClanahan Publishing House, 2010. ISBN 978-1934898093. Domine, David. Insiders' Guide to Louisville (Insiders' Guide Series). Globe Pequot, 2010. ISBN 978-0762756957. Domine, David. Splash of Bourbon, Kentucky's Spirit. McClanahan Publishing House, 2010. ISBN 978-1-934898-06-2. This page was last edited on 28 March 2019, at 06:17 (UTC).